European Coaching Corner: 8- Where to start to teach soccer? 8- Where to start to teach soccer? One of the principle problems that the Teacher/Coach when begin the process of teaching/learning with a team of young players are "Where to Start to Teach?" Before starting the process of teaching/learning the Teacher/Coach should consider what context which should be based on the teaching of soccer in the early years of training (develop). Under this presupposition, the teacher/coach should then to make a season planning, collecting the largest possible number of information about the group/team that will teaching/coaching, defining the objectives desired and follow the program that will serve as a guide and advise to teacher/coach throughout the long process of teaching/learning. Planning a season of soccer are like to prepare a trip. Are advisable to have a map and a program to achieve the objectives, to not get lost and avoiding wasting time and energy. These and other information will be properly prepared, organized and worked, should be part of the Coach Files, which should become a working document prominently in constant consultation and that will allow you to have a control on a regular and systematic of all the process of teaching/learning. For the development of young players are organized the coach should organize the training process systematically which will go to possible the young player the experiences of learning situations properly structured. After being identified with every information regarding the season planning, the first source of information that the teacher / coach must take when the first time the young players come to the club must be conveyed through observation (Rating diagnoses). The first session of teaching should be composed of a game or a set of small-side-games, is essential to let the young players play freely, observe them, understand their attitudes, their reactions, with no intervention by the teacher/coach. The observation must be made from the first until the last minute of the session teaching and should be done not so on the playing time also at breaks (water time, the first minutes after practice end), observing their behavior in their relationship with teammates, with the club as well with the assistant of coach. Through observation of the game are fundamental to understand at what stage of teaching soccer are that the players are, what level of play that players have and register the observations made so that, later, the teacher/coach can make their proposals to improve the lesser aspects detected in young players. Some teachers/coach's when they start their functions in the teaching process with the young players that are in the early stages of learning the game, are sometimes too apprehensive by the difficulties expressed by these, the prevailing confusion and the poor level of play shown by the young players. Often, these situations are due to unrecognized from the part of teachers/coach's, the characteristics of the level of play in where are the young players in playing soccer . - Agglomeration around the ball (where is the ball is all). Teaching soccer are an attractive and motivating task, but requires at the same time, great perseverance and patience on the side of the teachers/coach 's as well as those involving the developing process of young players (Directors, Managers, Parent's, …). 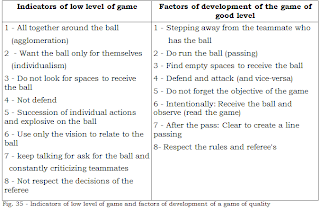 The game that the player are able to do, we-identified the main problems and outline the factors of evolution to permit access to the “Game of Good Level"
The game plays a key role in teaching soccer. Thus, we must start from the game and, through their observation, located at what stage of learning the game are the players and identified major problems existing. After we try in the teaching sessions (practices) solve the problems detected through the exercises: of appropriate resolution. Finally back again to game, for we realize that the proposals already submitted by us were resolved in game situation. I have to say that in the early stages of teaching soccer, the main concerns of the teacher/coach should focus mainly on capacity building coordination, fundamental aspects related with the ability to react, the balance, the lateralization, the orientation in space, the rhythm and the notion of time, associated with the development of the relationship of the player with the ball (1 * step in teaching soccer) and the development of technical skills, using the dominant leisure situations and small games of soccer in situations reduced. Having the young player an optimum age in terms of motor learning, the sessions of teaching/learning should have a greater dominance on the coordination development of capacities. Knowing we'd start our functions in the teaching of soccer with a group/team that is in 1* stage of teaching and learning the game - "The Relationship of the Player with the Ball", so we go to teach the contents of the next stage, when after the evaluation we verify that the players have properly sediment the learning for this 1* stage should follow the same philosophy in the nest stages, until reaching the final stage of the developing process. 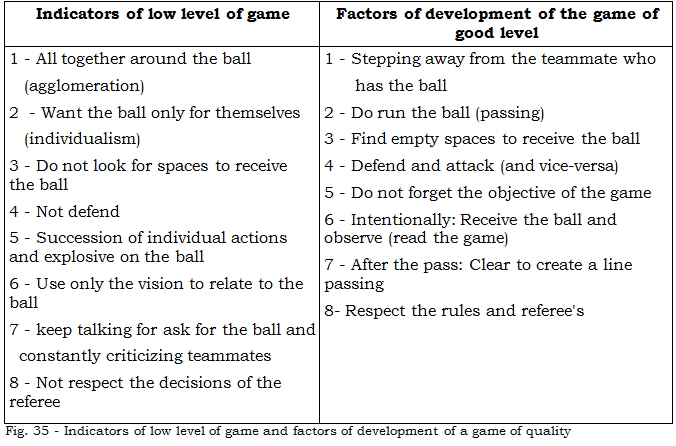 The process of teaching/learning are a slow process, reason why we should not hurry to go the next stage without being properly consolidated knowledge of the previous step, avoiding burning stages, so that the end of the process of develop be in the presence of a player to be able to develop a game of quality. Understanding that the technical skills should be improved from the moment that the game situations so require. The importance of exercises the ability so has coherence when carried towards develop the capacities of play the players, because "we are teaching and the players are learning to can be players, players in the game". What I currently still have observed, in the most of “clubs" are the organization of exercises of teaching the technical abilities, are done almost exclusively through forms analytically, stereotyped, with little relations with what is happening in the game, through situations very repetitive and for long periods of time, finishing the same by creating some demotivate and boredom in players, become so ineffective in terms of learning. When the situations of teaching/practices are built without the presence of an adversary, they do not pose many problems to the player, since this mechanized their actions, therefore not obliged to think or make decisions (the teacher/coach decide how to do), when know that soccer are fundamentally a game of making decisions (the player). In sessions of teaching/practice, we should allow more time to teaching the game than the actual teaching of technical skills in isolation form. Competitions pose a series of problems for players, requiring in most cases they have to solve without the help of their teachers/coaches. The sessions of teaching/practice should, then, constantly create problems to the players, so that they can solve themselves the same way as in competitions, should the teacher/coach intervene only in cases where their help is extremely necessary. The game should be present at all sessions of teaching/learning because to be at the same time a great source of motivation and the best indicator of the evolution and limitations of the players. “The technical-tactical level of professional players has declined in recent years. It runs more; there is more physical strength, but much lower quality, which is very concern. The problem is in the youth soccer and their coaches. They want the young players imitate the professionals and they are completed wrong. What young players should do are play. Are act with freedom and joy and not prejudge them by the longing of win or the drama imposed by the coach, converting each game in a matter of life or death”.